Taken from left to right, the first apartment to overtly draw this connection to marriage is the one belonging to his newlywed neighbors (Rand Harper, Havis Davenport). Even though Lisa isn't aware of it, this window gives her ammunition in her contest of wills with Jefferies. It bolsters the idea of marital bliss, as the honeymooning couple keep their window shades drawn and, we presume, enjoy making love over the entire course of the film. 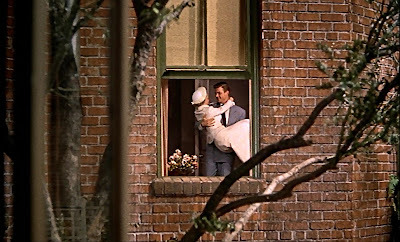 At the climax of Rear Window, the bubble is burst when the newlyweds have their first fight. The next apartment belongs to Miss Torso (Georgine Darcy), a beautiful, voluptuous, serial dater that entertains a seeming revolving doors-worth of suitors (once even hosting several simultaneously). "She's like a queen bee with her pick of the drones," Jefferies tells Lisa. "I'd say she's doing a women's hardest job, juggling wolves," Lisa responds. 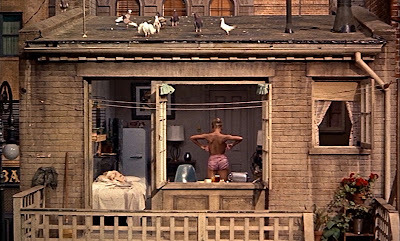 Miss Torso's apartment represents Jefferies' jealousy, illustrating his idea of Lisa's activities while he is away on photography assignments. "She's not in love with him, or any of them." "How can you tell that from here?" Jefferies asks. "You said it resembled my apartment, didn't you?" says Lisa. Lisa's assurances gain traction when Miss Torso's boyfriend returns from military service. A schlubby, short fellow, he is the only one who she ends up showering with physical affection. 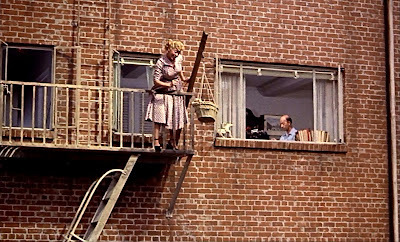 Upstairs from Miss Torso is an older couple (Sara Berner, Frank Cady) with a puppy. They represent Jefferies' fears of the kind of future that awaits him and Lisa if they do end up getting married; they might be reduced to a silly pair of Bickersons. Doting on some child or animal, they might communicate only through that object of affection instead of directly to each other. Downstairs from the older couple is Miss Lonelyhearts (Judith Evelyn) and to the right of Jefferies' window is the songwriter (Ross Bagdasarian). Each of them stand in for our central characters' self-image. Miss Lonelyhearts play-acts what it must be like to be married and loved. She makes dinners for two despite living alone, ultimately sliding into a near-suicidal depression over the course of the movie as the reality of her loneliness begins to overwhelm her. Hitchcock presents Lisa's identification with the spinster visually, in a brilliant shot where she stands in the apartment directly above that of Miss Lonelyhearts' in virtually the same part of the frame. Both stop in their tracks at the same moment, enchanted by a tune the songwriter has been working on throughout the picture, one he has only managed to crack at that moment. Jefferies, meanwhile, passionate over his career (as an artist of sorts), identifies with the songwriter. Jefferies admires the uncompromising musician, who works on compositions well into the night ignoring sleep and romance in the service of his art. At the conclusion of Rear Window, the songwriter and Miss Lonelyhearts take tentative steps towards romance, bonding over the tune (which we find out is called "Lisa") and foreshadowing Jefferies and Lisa's own romantic resolution. There is one window I skipped over, the one directly opposite Jefferies' second floor flat. 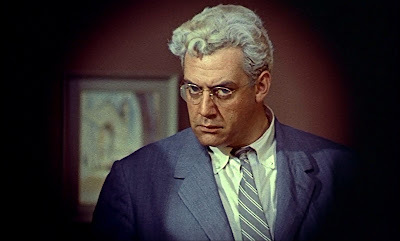 It belongs to Rear Window's antagonist, Lars Thorwald (Raymond Burr). Perhaps it is this window that most frightens Jefferies because he finds himself sympathetic to Thorwald's situation. It represents Jefferies' ultimate fear: to have compromised so much in a relationship, to feel so trapped that he finds the only way to escape his marriage is through murder (a frighteningly real option in a time when divorce led to social ostracizing). The horrific reality of this particular situation compels Lisa to break into Thorwald's apartment. In acting out a way to bring justice to this possible killer, Lisa is physically combating Jefferies' worst fear, hoping to convince him that he would never give in to the darker aspects personified in Thorwald. 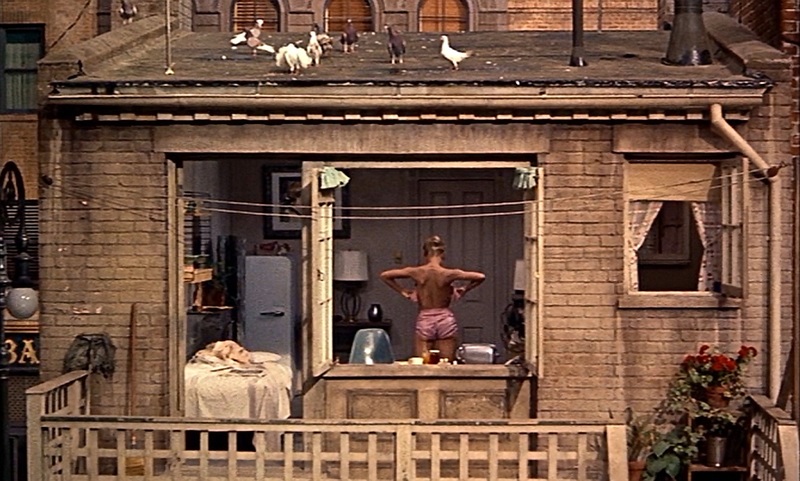 In Rear Window, Hitchcock's subjective camera does more than offer viewers Jefferies' visual perspective. It also allows viewers to experience his state of mind. Each dwelling represents a compartment of Jefferies' own mind, housing a specific misgiving he has about marrying the eager Lisa. 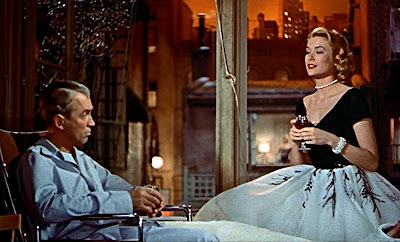 Viewed through this prism of marital commitment, Rear Window proves to be an even more satisfying example of Hitchcock's presdisposition towards the psychological thriller. The specific goal of this blogathon is to raise $15,000 to stream the recently found three-reel fragment of The White Shadow (1924) online for free and record the score by Michael Mortilla. The White Shadow was directed by Graham Cutts and written and assistant-directed by the subject of this blogathon, Alfred Hitchcock. 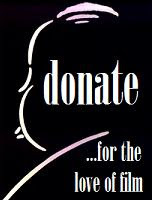 Please donate any amount you can to support the National Film Preservation Foundation by clicking on the button below. The National Film Preservation Foundation is the nonprofit organization created by the U.S. Congress to help save America's film heritage. They support activities nationwide that preserve American films and improve film access for study, education, and exhibition. 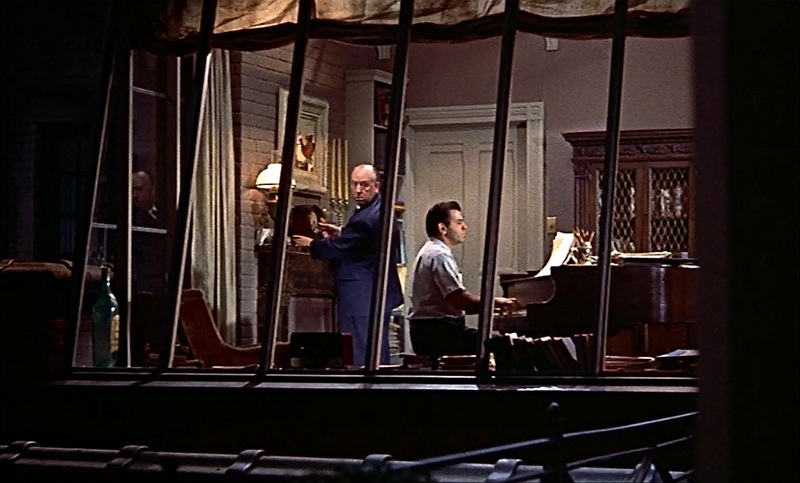 Interesting that Jeff identifies with the one window, that of the composer's, that's depicted with bars across it - is this a hint of the entrappment that can come from isolation in one's own art? At least Miss Lonelyhearts ventures outside her apartment. 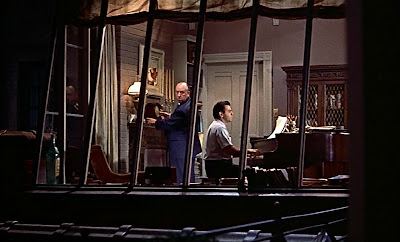 In the party scene in the composer's room, the guests seem isolated within his window bars; it emphasizes his confinement and isolation. Perhaps that's another possible foreshadowing of what might happen to Jeff in not committing to Lisa. Enjoyed your post! I like some of the insights you bring to the table, GOM. Thanks for commenting.